Have you ever heard someone say, “Motherhood is sanctifying”? Once you believe in Christ’s work on the cross for you, then starts the gradual sanctification until Christ returns. Our children stretch not just our bellies, but our patience and our beliefs. That process refines us and causes us to rely on Christ more and more. Children reveal our messy expectations. Nothing like a tantrum in the middle of a grocery store, or poop smeared on the bedroom walls to reveal what I really believe to be True. 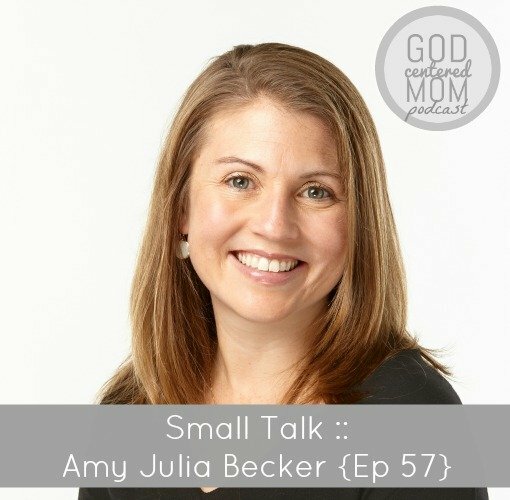 Today’s podcast guest, Amy Julia Becker, chats with me about her humbling, sanctifying motherhood journey. How her three children, including a daughter with Down Syndrome, have helped her grow up and hear more clearly from God. Amy Julia writes about her experiences on her blog at Christianity Today. She has also been featured on HuffingtonPost, Parents, NYTimes Motherlode and Time (click here to see all those articles). 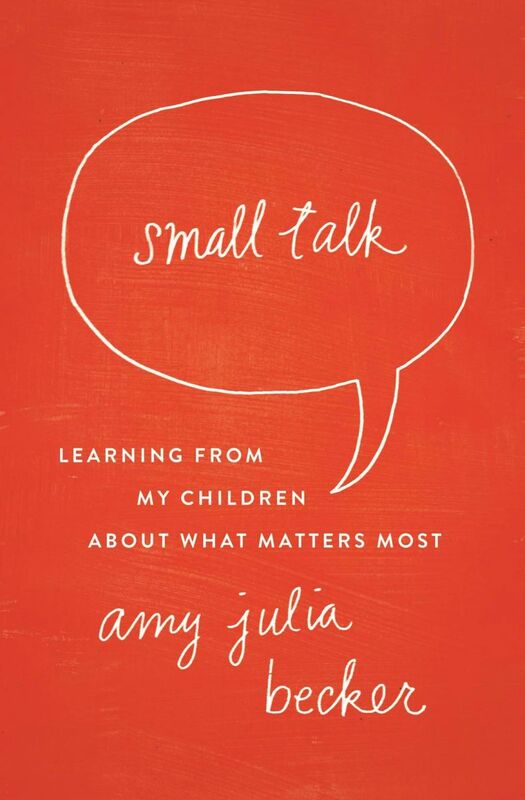 She has also written several books, her newest book is, “Small Talk: Learning from my children about what matters most”. My favorite conversations in this episode were: Amy Julia’s wisdom to see God’s image in our children, her thoughts on God’s faithfulness when we are faithless, and how to connect with others when we move to a new city. Giveaway details: Enter to win by leaving a comment on this blog post or leaving a review on itunes (instructions here). Contest ends, February 1st. Winner announced Monday, February 2nd. Amy Julia’s humbling mom moment when a few hours after birth, her daughter, Penny, was diagnosed with Down Syndrome. The expectations we carry into mothering. The challenge of parenting to not create our children in OUR image, but to see God’s image in them. The gifts given back to Amy Julia as she watches Penny grow and develop skills didn’t expect to have. The ability at birth to see our kids as blank slates. The wake up call Heather had after reading Amy Julia’s newest book, “Small Talk”. How we shouldn’t feel pressure to be fully present, all the time, with our children, but setting up intentional times to connect and chat with them. How God works in our own lives through our kids’ questions. The two things Amy Julia hopes parents get out of reading, “Small Talk”. The year of faithlessness and discontentment for Amy Julia (aka, “the year of wine & nachos). . .how God carried her in the midst of that season. What helped get her out of that season, and being realistic when moving to a new city with 3 young kids. The humbling (and blessing) of needing and receiving help. What’s a favorite question your child has asked? Thank you so much for your work here ladies! You are both inspiring and God is using you! Would love to win “Small Talk” ! This was very good! I think this is a book that would encourage one of my beautiful daughters…mama of 3 and homeschooler! We have just moved so what you all shared about that was encouraging. I also identified with the struggle of your child having a hidden “difference” as they get older and would love prayers for direction and compassion as I mother (and teach- I homeschool) him and his siblings. Thanks for the podcast… I have enjoyed listing. So thankful for your blog and the resources you provide! They keep me grounded, engaged and steadfast in my relationship with Jesus! I am a new mommy and your podcasts have been life changing 🙂 You are using your gift in such a beautiful, inspiring way! well. . .aren’t you the sweetest!!?!! thank you so much for your encouragement. so glad they are helping you as you walk in faith. Loved the podcast! So many wise words from you both. So many beautiful thoughts here, Amy Julia. I just finished (and reviewed on my blog) A Good and Perfect Gift, and am dying for a copy of Small Talk. They don’t carry it at my public library! Anyway. Thanks for being you and for writing the way you do. Heather, thank you for sharing another inspiring guest with us. It’s amazing how each and every mom has something to share about their journey and what God has taught them along the way. Though our journeys may be different we can each find common ground in the joys and struggles of motherhood. Thank you for your ministry, you bring more blessing and encouragement into homes than you know. thank you tasha for your sweet words of encouragement! Helps to know recording, editing and sharing these stories is helpful to moms, blessing and lifting them up. seriously. thank you for stopping to comment! Thank you for this giveaway! The podcast interview was fabulous! So many things God spoke to me about through it. The book sounds terrific and I would be very blessed to win! God bless you! This is great. Looking forward to listening! Thank you so much for sharing! The book looks great! Great book – lift of encouragement – would love to pass along a copy! I can’t even put into words how much this episode touched me. Many many hours drowning my heart in chocolate and coffee. This story gave me breath when I have been struggling to breathe from all the pressure I have put on myself. hey amber! thanks for taking the time to comment. . .and for sharing your own “wine & nachos” story. May God continue to give you rest and His presence as you come out of this season. I loved this podcast! I listened to several parts twice. My favorite piece of wisdom was to see God’s image in our children and call it forth. So good. Hi Heather~ Long time listener…but I have never commented. 🙂 I always love your podcasts-I listen on the treadmill. Sometimes I don’t relate to your guests because I have older kids (13 & 19). But, this podcast when Amy was talking about her daughter with special needs and that she just needed to accept her as she is. It hit me—that is what I have been doing with my teenage daughter. I have been treating her (and getting very frustrated) like how I expect her personality to be–more like mine! She is my daughter….but SHE IS HER OWN PERSON!! I have been so frustrated because I often wonder why she doesn’t act or react more like me or my son. I need to give her grace and try to encourage her personality more and ACCEPT that she is her own person. THANK YOU THANK YOU THANK YOU! wow!! just checking in on comments (late Saturday night fun!) and blown away. . .thank you for taking the time to share that with me. God is going to find a way to speak Truth to our hearts one way or another. Have you ever listened to the podcast episode with Vela Tomba? On Hula-hoop-o-logy? May also be helpful on this topic. . .